Have A Pest? Call Doc Norris, All His Patients Die! Welcome to National Pestmobiles, We believe taking care of the customer is the highest priority. 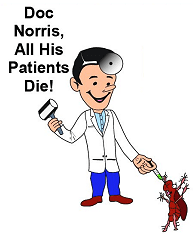 If you have a pest or termite problem, Doc Norris will take care of it for you. At National Pestmobiles we understand the inconvenience infestations can bring as well as your budget and safety concerns. We work hard to deliver effective, non-disruptive and affordable services that address your needs. All work will be performed by our licensed technicians with one goal in mind, to achieve complete customer satisfaction. Our service technicians are highly trained and very knowledgeable in all aspects of the industry. Keeping up with the latest technology in equipment, laws and regulations, and the safest means possible is important to our business and to your family. In addition to our professional termite and pest services, we also provide custom designed mosquito misting systems. No more ruined outdoor entertaining events, no more painful insect bites. Click Here to find out more information on our Mosquito Misting Systems. And be sure and look over our Frequently Asked Questions page on Mosquito Misting Systems. "Doc Norris" has your answer to all of your mosquito and other flying insect problems. National Pestmobiles offers quality residential, commercial and industrial pest and rodent control services in the Dallas, Fort Worth metroplex. We understand that you,the customer, want your experience to be convenient and efficient. Our pest control technicians are trained to identify pest concerns and can offer solutions to suit your needs. Offering a wide variety of pest and rodent control services, we can provide pest management for all structural infesting insects, rodents, and most wild animals. All Pest & Rodent Control. Termidor Certified Professional.